If the weather becomes rainy often, you’ll want to be prepared. A polished bun can give you a classic look and protect your hair from becoming crazy looking in the rain. Put your hair in a ponytail and braid and then pin into a bun. If you need to keep hair out of your face to secure it down, use bobby pins and hair spray. Your hair might become very dry as the weather changes, so make sure you get a haircut. Remove any dry, split ends by getting a quick trim. Aim to get a trim to remove dead ends every 8 to 12 weeks. Use a deep conditioner or deep conditioning treatment in between to maintain strength and silkiness. If you want a new color or want to go lighter naturally, ask for Balayage highlights. They are more subtle than regular highlights and can allow you to have a fresh look for Spring that isn’t shocking. Air dry when you can. Take a break from hot tools on your hair, especially if you used them every day in the winter months. Air drying will allow you to maintain your hair’s health and natural texture. Rotate your products. Take stock of what products you are using and which ones you need to swap out. You won’t need heavy products as the weather warms up and you may need to swap to products that tame warm air and humidity. If you are unsure which products you need, ask your hairstylist when you get a trim. 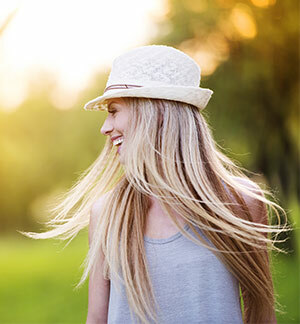 What do you do to transition your hair from Winter to Spring? What are your favorite Spring looks or products? Share with us!